BIRMINGHAM, England (CNN) -- British police have arrested nine people who they say were planning an "Iraq-style" abduction inside Britain, a senior security source told CNN. That source said the plot was to include the torture and beheading of a British Muslim soldier. British security sources did not identify the soldier, but said he was back in Britain after having served in Afghanistan. Eight people were taken in the early raids; the ninth was detained hours later on a major road near Birmingham, about 200km (120 miles) northwest of London, David Shaw, Assistant Chief Constable for West Midlands police, said. He told reporters at a briefing the operation was the result of months of hard police work, but it was by no means finished. The arrests were made after raids at a number of Birmingham addresses by the Midlands Counter Terrorism Unit, the West Midlands police and Metropolitan Police. Among the addresses raided were several residences and four businesses, Shaw said. One of those, according to CNN's Paula Newton in Birmingham, was an Islamic bookstore called Maktabah, but it is unclear if any arrests were made in that store. Another business raided was a mobile phone shop, Newton said. The West Midlands Police said the nine were arrested on "suspicion of the commission, preparation or instigation of acts of terrorism under the Terrorism Act 2000." The terror arrests did not involve a plot to cause mass casualties, but instead apparently centered on the kidnapping of a British Muslim soldier who had served in Afghanistan, the senior security source said. Once kidnapped, the attackers allegedly planned to videotape the torture and execution of the soldier for later publication on the Internet. According to the source, the soldier was not a high-profile figure. "This is a major breakthrough in thwarting what seems to be a genuine and terrifying potential crime," said former Scotland Yard commander, John O'Connor. "These are not the kind of people that take hostages." Security sources said this new alleged plot style would herald a different tactic from previous attacks by terrorists in Britain, who have used coordinated explosions aimed at killing and injuring the masses. Instead, it would have mirrored the kidnappings of hostages Ken Bigley and Margaret Hassan -- both Britons murdered by Iraqi insurgents. A U.S. intelligence official told CNN there were no indications that the alleged plot posed any threat to the United States. The official said early information suggests that those arrested Wednesday were part of a "small, not very sophisticated cell." What is of most concern, said the official, is the discovery of another homegrown cell within Britain that has been radicalized to the point of planning an event. The official said it was "murky" whether any of the people arrested had ties outside of Britain. Unlike those connected to last summer's alleged plot to blow up U.S. planes flying from Britain to the United States, there is no definitive information at this point that links those detained Wednesday to Pakistan or anywhere else, the official said. The men are being held in a West Midlands police station, not in London as is usually the case with suspects arrested under the terror act. Authorities can hold them for up to 28 days before either charging or releasing them. British Home Secretary John Reid cautioned the media about speculation that may damage any potential future case against those detained. "There is a major operation investigation going on and there may be court proceedings in the future so I think we should all act in a manner which avoids any interference at all in either the investigation or any future proceedings," he told reporters Wednesday in London. Two of those men -- Rizwan Ditta, 29, and Mohammad Bilal, 25, both from Halifax -- were charged Monday under the Terrorism Act 2000. The other three men are still being questioned by the Greater Manchester Police. "This operation is a reminder of the real and serious nature of the terrorist threat we face," the Home Office said Wednesday. Security services believe a terrorist attack is highly likely in Britain. An attack on London's public transport in 2005 killed 52 people, and the country is on its second highest alert level. Last year the head of MI5, Britain's domestic spy service, said that about 30 terrorism plots were being worked on and agents were monitoring around 1,600 suspects. 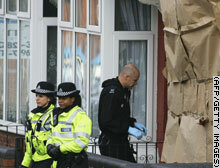 Police stand guard outside an address raided by police.